Mommy and I were excited about visiting Las Vegas for baby’s first Christmas, but after our difficult time packing for baby’s first airplane ride we were worried about baby’s first time at the airport. Whereas we were nervous for her, Arya loved her first visit to the airport. When she wasn’t smiling back at all the people looking at her she was busy crawling around the terminal looking for new toys. We arrived more than two hours before our scheduled flight time to ensure lots of extra time to clear security and deal with any potential accidents on either side of security screening. Our extra time was used up quickly as it took longer than I expected for every part of our trip to the gate. Looking for elevators (rather than taking escalators) and walking very slowly to accommodate all our carry-on luggage took up time. While relatively painless, getting through airport security was also quite time consuming. TSA workers were surprisingly accommodating when we cleared security. Whether out of consideration or concern for being forced to stay past their shift, they directed us to a different security lane specifically to avoid a crowd backing up near the three open lanes. It took several minutes to remove our electronic devices and load all of our bags onto the conveyor belt for screening. In the interim a security officer pushed our empty stroller through the metal detector to another area for further testing. 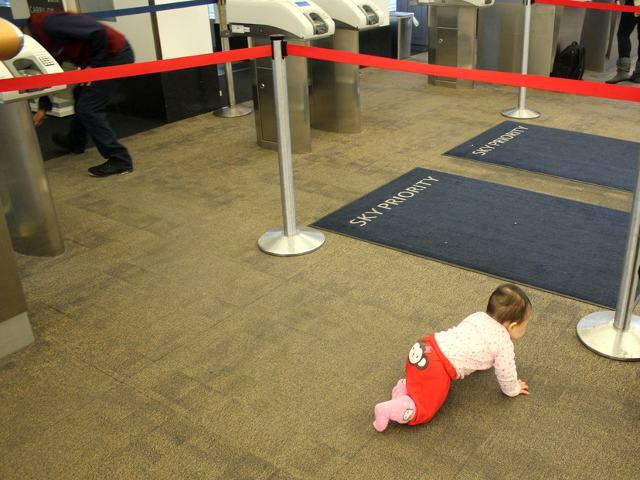 They did an especially thorough job of examining our large stroller and car seat, but the process was no different than any other adventure through airport security. Once we cleared security we still had a half hour before boarding. Arya was delighted to get out of her stroller and we let her crawl around the gate area to get some exercise before being cramped on the plane. With lots of other babies and children around due to the time of year, we weren’t overly concerned about complaining passengers. Nonetheless it felt good to be able to give our baby some time to get out her excess energy before being forced to board the aircraft. Arya had fun during her first time at the airport. She was relaxed and happy once we got onto the plane and the resulted in baby’s first airplane ride being far easier than either Mommy or Daddy expected.